Residential properties and other properties deemed by the risk assessment are required to be able to ventilate the products of combustion away to allow the safe escape of building occupants and access to the fire and rescue services. The most common use of smoke ventilation is within the common parts of residential dwellings where the evacuation policy is a stay put policy i.e. where only the occupants within the flat of fire are required to evacuate. 1. 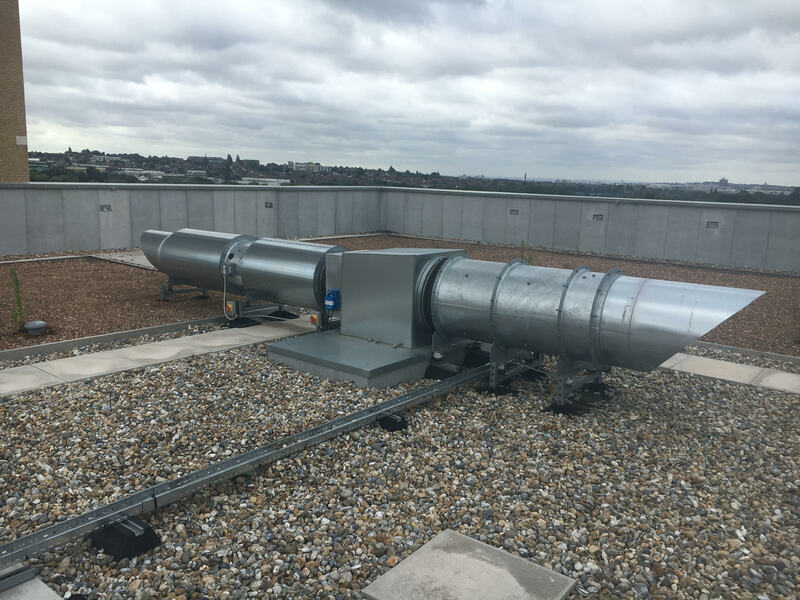 Free air natural ventilation, whereby a vent is provided directly to an outside wall, or into a large vertical chimney shaft that expels the products of combustion at roof level. 2. Air is drawn into the chimney shaft by either pressurisation or reverse pressurisation which is actuated by mechanical means. The second method allows the use of a shaft that is much smaller in diameter than a natural ventilation shaft, as the smoke is propelled out from the building, which ultimately means more useable floor space. Firenso can offer the design supply, installation, commissioning, and ongoing maintenance of smoke ventilation systems.